COLUMBUS, Ohio -- There will be "ample security" at the funeral for six of the eight people shot and killed in rural southern Ohio in what authorities call a planned attack targeting one family, Ohio's attorney general said. The service Tuesday at a West Portsmouth church is the last of three funerals for the victims. Seven adults and a 16-year-old boy from the Rhoden family were found dead April 22 at four properties scattered across a few miles of countryside near Piketon, about 80 miles east of Cincinnati. All eight were shot in the head, some had other gunshot wounds and bruising, and none of the deaths appeared self-inflicted, authorities said. Three young children were unharmed. One family member told CBS Columbus affiliate WBNS-TV, "Nobody should ever have to bury a whole family. ... It's just really sad. It's something that shouldn't ever happen to anybody." 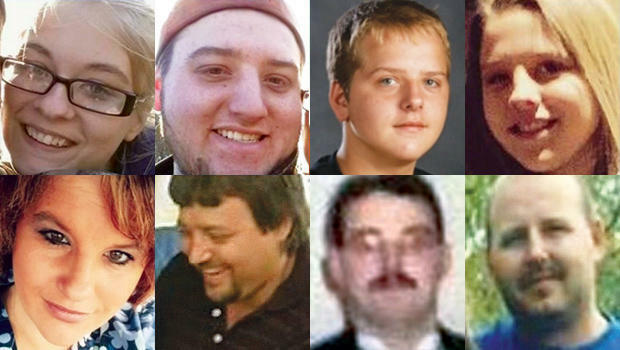 Still trying to determine who killed the victims and why, authorities have conducted nearly 130 interviews and are reviewing about 450 tips and more than 100 pieces of evidence, Attorney General Mike DeWine said Monday. They said they found a large-scale illegal marijuana growing operation at one of the crime scenes and said pot was being cultivated at some of the other homes, too - something not uncommon in this corner of Appalachia - but they haven't said whether they believe that to be connected to a motive. DeWine said he wouldn't speculate as to whether a threat to the family remains. "We have no new information that would indicate that there is a threat to any of the members of the family," he said. "We don't have any information on that. And we did not when we initially said it other than the fact we had eight people killed." The last funeral honors 40-year-old Christopher Rhoden; his ex-wife, 37-year-old Dana Rhoden; their three children, 20-year-old Clarence "Frankie" Rhoden, 16-year-old Christopher Jr., and 19-year-old Hanna; and Christopher Rhoden Sr.'s brother, 44-year-old Kenneth Rhoden. The funeral home titled their online obituary simply "The Rhoden Family," with a section listing how each of those victims was linked to the others and their survivors. Services for a cousin, Gary Rhoden, 38, were held Thursday in South Shore, Kentucky. Mourners remembered Frankie Rhoden's fiancée, 20-year-old Hannah Gilley, at a funeral Saturday in Otway.